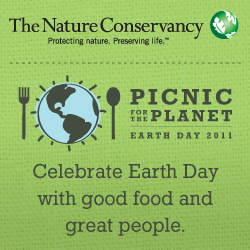 Join The Nature Conservancy in their 2011 Earth Day campaign, called Picnic for the Planet.They ‘re asking people to celebrate the planet by rounding up some friends and taking the planet out to lunch. They already have a number of meetups going on around the globe; just visit our map to find a picnic near you or see how you can start your own. Like to do more? Visit their top 5 Earth Day action list below and spread the word!